You might have missed the announcement a couple of weeks ago, but the Googlers posted on their blog that Amber Alerts are now integrated with Google's Search and Maps. By increasing the availability of these alerts through our services, we hope that more people will assist in the search for children featured in AMBER Alerts and that the rates of safe recovery will rise. While this service is only available for US Amber Alerts at the moment, the Googlers are working with other countries, including Canada, to expand the service. 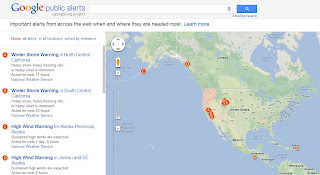 In researching this, I learned that Google has a service called "Public Alerts" which is a handy map mash-up of weather, earthquakes and other types of alerts. I thought these types of alert systems would be on Gov sites. Of course, when you think about it, it makes sense that Google would be compiling info and most likely leveraging real-time search results to help improve the accuracy of the information in an alerts system. A great tool. Go bookmark it right now.